While most professionals in the Caribbean region have never attended a time management course, or read a time management book, they probably believe that they could benefit from an improvement by improving their own productivity. Most exist with little more than the skills they taught themselves while studying for their CXC and CAPE exams, using the best approach that their teenage minds could muster at the time. That most regional professionals do little to upgrade their skills is not surprising – after all, there exists very little by way of standardized training in this area. What is surprising is that time management is seen as a “nice-to-have skill,” as opposed to an essential building block. The truth is that each and every professional in the world is subject to time limits. An entry-level clerk in a book-store in Montreal has exactly the same amount of time available to him as does the Houston-based CEO of Exxon Corporation. Obviously, they are spending their time very differently. It could be safely assumed that the two professionals are different in the level of knowledge that are brought to the tasks that they perform. They probably also are motivated very differently. It would be a mistake, however, to assume that the clerk can handle all the tasks and demands that the CEO is able to manage – in fact, the CEO would not have risen to head one of the world’s largest companies without an outstanding ability to manage his own productivity. Although the clerk might not appreciate the difference, it is likely that the difference in ability is tremendous. Given the fact that all professionals are operating with the same time constraints, and that some are more skillful than others, it is essential for a young professional to think of time management as a critical and differentiating skill. A career starting or ending in the new millennium can last anywhere between 40 and 60 years. During that time, the very best and capable professionals never stop the search for improved time management techniques. They attend seminars, read books and hire coaches in order to learn the latest thinking that can be applied – both on the job and in their personal lives. They know that it is difficult to change habits, and are always on the lookout for a new insight or distinction to help them make a big shift. They can very clearly see the trap of thinking that they have “arrived” at any particular level of time management skill. One of the traps that young professionals often fall into is to believe that they cannot possibly accept another assignment or project because “there is too much on their plate.” Unfortunately, they sometimes listen to other people at the lunch-table complaining that “I have too much to do” – and after some time, they join in. If their complaint turns into a belief, and they begin turning down assignments as a result, they often do not realize the damage being done to their careers. 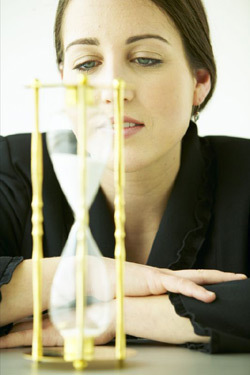 Over time, they “train” their managers to see them as limited, and their time management skills as low. I worked with a junior manager once who told a CEO that he was “too busy” to meet with her. While his honesty was refreshing, his lack of willingness to grow to meet the challenge of a new assignment was saddening. His career suffered as his reputation took a hit. On the other hand, a young professional should not go in the other extreme and say “Yes” to everything that is passing by. In so doing, they run the risk of never getting anything completed and developing a reputation for not delivering. Instead, professionals at all levels need to be savvy, and learn how to accept new assignments knowing that they will have to change their time management habits to get them completed successfully. They may very well start out not knowing whether or not they will be successful. However, they can be determined from the outset to work as hard as possible to find a way, often using the resources around them (including their own manager) to accomplish a new level of productivity. The result is that once the assignment is complete, they are simply not the same. The fact that rapid changes in new technology are continuously changing how time can be managed means that a manager must stay abreast of the latest and newest tools. A manager who refuses to upgrade their skills, and never budges from the use of paper will only allow the distance between them and their colleagues to increase. They will make more mistakes, take more time to respond and lose more information than others around them who are skillfully using technology to get more done. Their severe discomfort will not allow them to evaluate new technology on the proper merits, and miss the opportunity to enhance their careers, learn, grow and be promoted up the ranks. For example, the first generation of Personal Digital Assistants (PDA’s) were quite unreliable and difficult to use. Some professionals swore off their use after their first unit crashed, taking all their data with them. However, since that first generation of PDA’s were developed, there have been many critical improvements, making the devices easier and much safer to use. Professionals must keep abreast of these changes, as a well-managed PDA (either operated alone or built into a cell phone) is the absolute best way to manage information, schedules and tasks away from a one’s PC. What the savvy professionals does that is that they are not eager to go out and buy the latest gadget, as if it were the latest toy. Instead, they are looking to find ways to be more productive, and the new PDA is only useful if it somehow helps the professional to accomplish more with less effort. Here in the Caribbean, both life and business are subject to extremes in weather as well as unreliable supplies of electricity, water and sound roads. Large scale catastrophes such as hurricanes are always looming around the corner, and daily, unplanned disruptions due to crime, traffic or poor coordination by local governments are daily occurrences. The result is that the local professional must develop systems that are extremely flexible, and self-contained, with redundant actions and resources built in, just in case “something” happens. If there is one caveat to the three practices described above, it is that any techniques developed outside the region must be customized to local realities. In fact, there is not a single time management system that can be imported wholesale and used without modification. The onus returns to the professional – the one who is always learning, open to new assignments, and looking for new technology – to develop a personal time management system that works for them, but can be adapted to handle each stage of their, hopefully, burgeoning career.